Amsterdam is one of the loveliest cities of Europe and is filled with many great hotels. 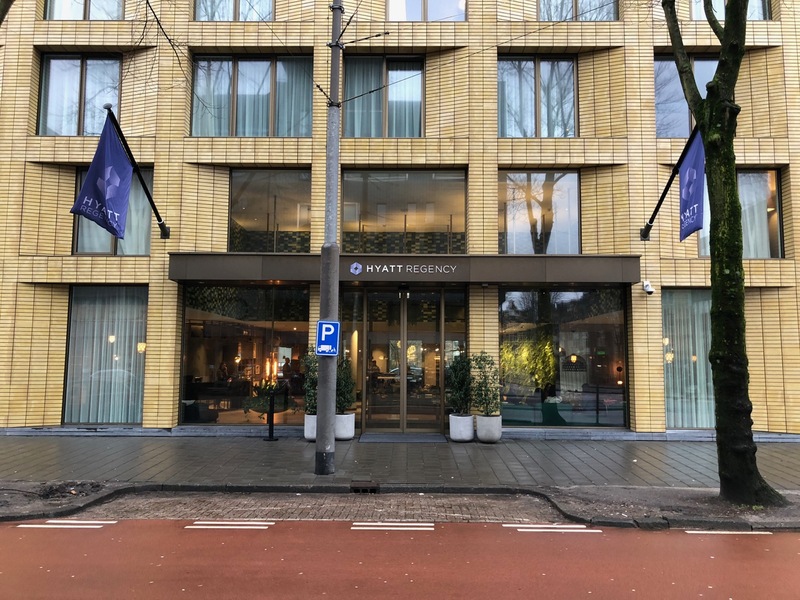 For Hyatt fans, which is the better choice, the Hyatt Regency or Andaz Prinsengracht? In terms of comfort, you cannot go wrong with either hotel. Beds are excellent at both properties and rooms are comfortable. The guest room at the Andaz is more eclectic looking (to put it mildly) and you might find the open floor plan a bit less comfortable than a totally separate bathroom at the Hyatt Regency. Both hotels have a fitness center and sauna. Neither hotel has a swimming pool. Both have inviting common areas. All non-alcoholic beverages and snacks in the minibar at the Andaz are complimentary, but the Hyatt Regency has a snack bar downstairs that features tasty treats. While the Hyatt Regency has an attractive Regency Club, the Andaz offers a complimentary happy hour for all guests as well free coffee and tea throughout the day. Both hotels have nice outdoor garden areas were you can enjoy a drink or snack during the warmer months. The Andaz is located in the heart of central Amsterdam, surrounded by beautiful architecture and within walking distance of many great restaurants, bars, and museums. The Hyatt Regency Amsterdam is located in a more quiet part of town and only two minutes from a Metro stop. If you do want to walk to the Museum Quarter, give yourself about 20 minutes. The Bluespoon Restaurant and Bar offers an upscale dining experience for lunch and dinner at the Andaz. Think tasting menus, farm-to-table, and craft cocktails. In the mornings an elaborate breakfast buffet is offered. Over at the Hyatt Regency, Mama Makan Restaurant fuses Dutch and Indonesian food for lunch and dinner and also offers a nice breakfast breakfast buffet in the morning. I like that the Hyatt Regency offers an extensive room service menu at prices that are far from the highway robbery you often pay at nice hotels. I found service generally excellent at both properties. I have a lot more stays at the Hyatt Regency than Andaz, but appreciate that both accommodated my early check-in requests. Both also recognize Globalist status and will offer upgrades when available. Which property do I ultimately prefer? I greatly prefer the location of the Andaz, but continue to return to the Hyatt Regency because it offers the better overall value proposition. Often it is 1/3 to even 1/2 the price of the Andaz and still manages to give guests superior comfort and amenities. But you cannot go wrong at either hotel. Nice review Matthew. AMS is on our (very) short list soon. As Globalist we’ve been trying to decide between the two. This helps. Leaning Andaz. I travel to Amsterdam a couple times per year. I’ve stayed at both and would not stay at the Andaz again. We were put in a room (low floor) at the Andaz facing the lobby and loud music was playing after 10pm – I could feel the bass in the room. I complained to the front desk but nothing was done about it for over an hour. The Hyatt Regency was a far better stay. I also dislike the Andaz’s sink and counter being out in the room. Hyatt Regency hands down over the Andaz. I have also stayed at both. I prefer HR b/c you get a comparable experience for a great value. The only reason for me to stay at Andaz again is if I only had a day or so and need to hit a lot of the tourist sites. Thanks for the timely reviews and comparisons. I’ve decided to stay at the Regency next spring due to the much lower price, access to a club lounge and a conveniently located nearby metro stop. Thank you so much for your kind words and your detailed comparison of our two luxury Hyatt brand hotels in Amsterdam. We really appreciate you taking the time out to share your personal experience with everyone. I am sure that this review will benefit many valuable customers in their decision making when it comes their accommodation choices while in Amsterdam. Both properties are unique in their own way and cater to the guests travel needs accordingly. The Andaz Amsterdam and Hyatt Regency Amsterdam both complement each other perfectly allowing our guests to have a choice. Whatever your choice may be in the future, please know that we are always happy to have you with us in both hotels. They both look like awesome options! I’m always amazed at how expensive hotels are in Amsterdam compared to similar cities. I’ll check these out next time I’m there.